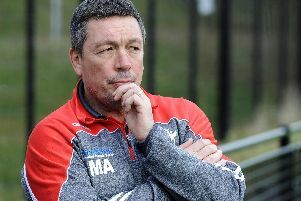 Working on improving the fitness of new signing Jason Crookes will be a top priority during pre-season, with Sheffield Eagles director of rugby Mark Aston stating he has everything else in his game. Crookes joined the Eagles on a one-year deal from fellow Championship side Batley, alongside Joel Farrell and James Davey in swapping life at Mount Pleasant for a new challenge in the Steel City. Aston is in the midst of revolutionising the Eagles for 2019, with five new arrivals announced and plenty more to follow as the Eagles chief looks to bolster his numbers for what is set to be a tougher competition next season. Aston wants his side to be a much tougher unit, and Crookes has the characteristics he has been looking for as he attempts to make his side a more competitive force after a difficult 2018. For Crookes to be the player Aston is looking for, pre-season will be crucial with the Eagles supremo stating the ex-Dewsbury ace’s fitness is the only area missing from his game. “We have spoken about where he wants to improve,” Aston explained to The Star. The 28-year-old centre certainly made an impression on the Eagles last season with a challenge on Joshua Toole which left the Irish international needing a spell on the sidelines. Crookes, who had a temporary spell with the Eagles during his Bradford days in 2011, departs Batley after two seasons with the Bulldogs. Aston likes the attitude of the ex-Hull FC ace, with the 51-year-old stating his personality is the right ingredient as he looks to address the culture in the Eagles’ dressing room.